Srebrenica Genocide Blog: KARADZIC: "MUSLIM ENCLAVES HAVE TO DISAPPEAR"
KARADZIC: "MUSLIM ENCLAVES HAVE TO DISAPPEAR"
The following article was published by New Straits Times on 17 July 1995, six days after the fall of Srebrenica. This news report was located, scanned, re-typed from newspapers and then sent to us by the Bosniak and Jewish Solidarity. Thank you for your contribution. "Bosnian Serb leader Radovan Karadzic, in a Spanish newspaper interview published today, laughed off the idea he might be tried for war crimes and said the concept of UN "safe areas" in Bosnia was untenable. 'The Muslim enclaves in Bosnia are no longer viable and have to disappear. If not we will take them by force,' he was quoted as saying by El Pais." 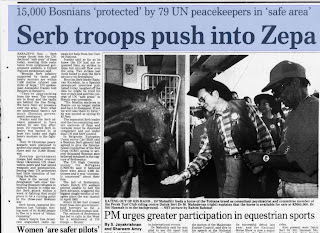 SARAJEVO - Serb troops thrust into the UN-declared "safe area" of Zepa today, meeting little resistance from outgunned government soldiers, a United Nations spokesman said. "Bosnian Serb infantry supported by tanks and heavy mortars are within 1,500 metres (almost one mile) of Zepa," UN spokesman Alexander Ivanko told Reuters in Sarajevo. "They're approaching from the west. The troops are in front and the tanks are behind the line firing. We have NATO air presence over the area... from what we understand there's not much (Bosnian government) resistance." Ivanko said the Serb advance appeared to have halted by late this afternoon. He reported Serb infantry was backed by at least two tanks and eight heavy mortars in the fighting. 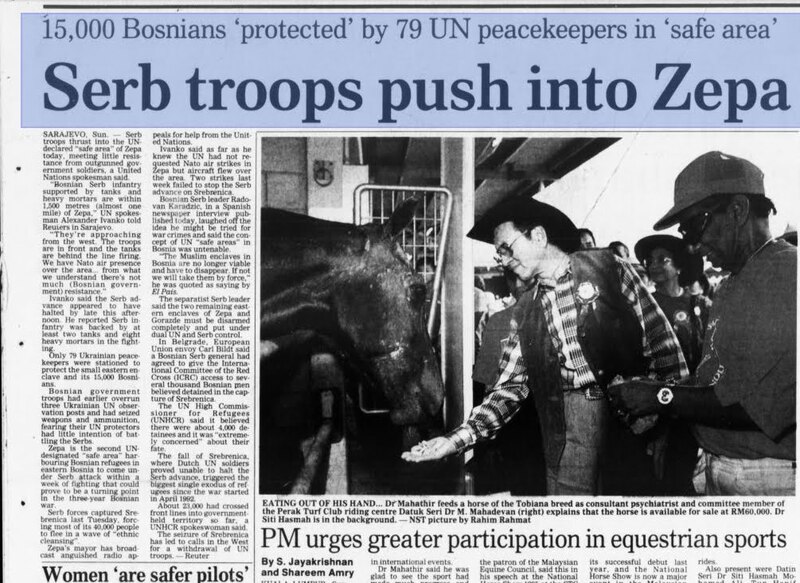 Only 79 Ukrainian peacekeepers were stationed to protect the small eastern enclave and its 15,000 Bosnians. Bosnian government troops had earlier overrun three Ukrainian UN observation posts and had seized weapons and ammunition, fearing their UN protectors had little intention of battling the Serbs. Zepa is the second UN-designated "safe area" harbouring Bosnian refugees in eastern Bosnia to come under Serb attack within a week of fighting that could prove to be a turning point in the three-year Bosnian war. Serb forces captured Srebrenica last Tuesday, forcing most of its 40,000 people to flee in a wave of "ethnic cleansing." Zepa's mayor has broadcast anguished radio appeals for help from the United Nations. Ivanko said as far as he knew the UN had not requested NATO air strikes in Zepa but aircraft flew over the area. Two strikes last week failed to stop the Serb advance on Srebrenica. Bosnian Serb leader Radovan Karadzic, in a Spanish newspaper interview published today, laughed off the idea he might be tried for war crimes and said the concept of UN "safe areas" in Bosnia was untenable. "The Muslim enclaves in Bosnia are no longer viable and have to disappear. If not we will take them by force," he was quoted as saying by El Pais. The separatist Serb leader said the two remaining eastern enclaves of Zepa and Gorazde must be disarmed completely and put under dual UN and Serb control. In Belgrade, European Union envoy Carl Bildt said a Bosnian Serb general had agreed to give the International Committee of the Red Cross (ICRC) access to several thousand Bosnian men believed detained in the capture of Srebrenica. The UN High Commissioned for Refugees (UNHCR) said it believed there were about 4,000 detainees and it was "extremely concerned" about their fate. The fall of Srebrenica, where Dutch UN soldiers proved unable to halt the Serb advance, triggered the biggest single exodus of refugees since the war started in April 1992. About 23,000 had crossed front lines into government-held territory so far, a UNHCR spokeswoman said. The seizure of Srebrenica has led to calls in the West for a withdrawal of UN troops.